Joey Camen's "My Life With Snoopy" is a laugh-out-loud tale of a human-dog relationship that brought joy to both parties. The book begins with Camen's early life in Detroit (including a traumatic incident with a dog that put him off dogs for awhile) and continues through his various moves to his career as a comedian in California. Anyone who has owned an animal knows how special the relationship can be, and Camen does an excellent job of capturing that. Camen is a great story teller, and he expertly interweaves the stories of his life with the stories of his relationship with his dog. The book is also filled with humor, which keeps the reader laughing throughout the book, despite the book's dealing with some darker topics (bullying, loss, etc). 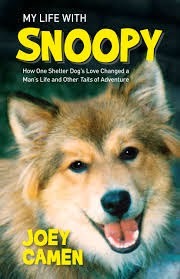 If you are an animal lover, "My Life With Snoopy" will have you laughing, crying, and reflecting on your own human-animal relationships -- this book is a must-read!